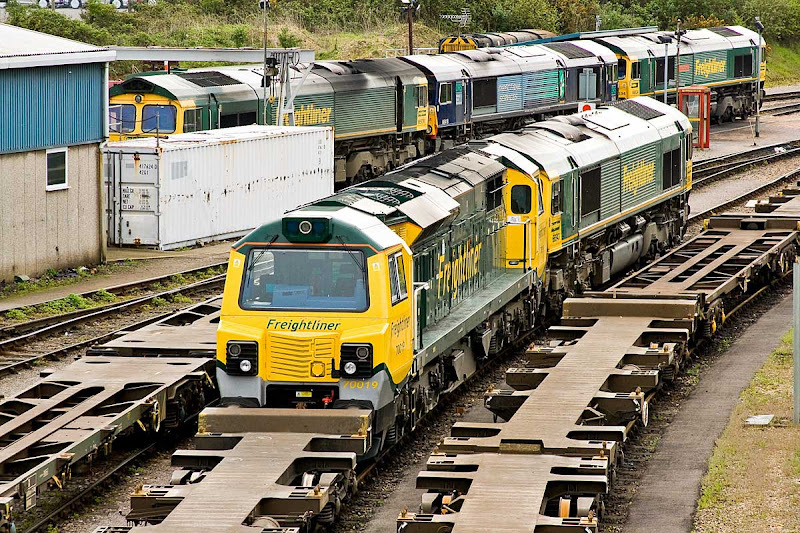 After the events of the last month, it apppears that the Freightliner Intermodal Class 70s are effectively "grounded" from 2nd May,given recent reliability incidents, in particular those which have impacted the South Western Lines between Basingstoke area and Southampton. The problems are understood to be with the crankcase and injectors of the GE Powerhaul P616 engine (derived from Jenbacher J616). Some 70s have been seen in use in the Midlands, but in general usage appears much reduced. - all three of these workings were southbound, and on or soon after the Reading to Basingstoke section. 70009 is in Eastleigh T&RSMD for engine repairs (A/100) - was worked south behind 70008 on 14th April. 70008 (powered working- assigned for Special Tests) + 70001 + 66534 were worked 0Y69 from Maritime to Eastleigh T&RSMD for attention on 5th May one two - the 66 was back on Maritime later in the day. This leaves 70019 at Maritime, where it spent time on Saturday under the bridge, but was later moved as shown above. It appears to be waiting for an N/100 (engine repair).